how can u not love kirby???????? thats like a frickin crime right there dude!!! kiry's THE BOM!!!!!!!!!!!!!! i mean hes just so fat and chubby, howcan u not like that??? de keuze van de fan: HE - IS - AWESOME!!!!!!!!!!!!!!!!!!!!!!! It was a peaceful, King Dedede-free morning in Pop Star. Birds chirped. Bunnies hopped around. All of the folks are playing merrily, and then there's... Kirby, who was flying in his Warp ster for the reason of feeling the breeze through his light, roze skin. Normally, he'd use the Warp ster as a mode of transportation, but today was the day. Here in Pop ster I can fly so high. 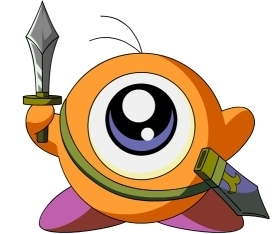 hallo everybody, just to let u know that this will be my first Kirby artikel here on Fanpop. So let's get started. As u may know that Nintendo Direct has announced a new Kirby installment called Kirby: Planet Robobot. Kirby: Planet Robobot will be released for Nintendo 3DS on June 10. When I first heard about it I was like, "This looks cheesy, but I purchased it anyway. I have to admit, my thoughts were wrong. For one thing, the graphics were awesome! The game makes u feel like you're in Kirby's position and reality is a distant universe. Also, the little "Movies" were very story-book like and entertaining. Another big thing that I love is having the Apartments and taking pictures inside them. I was surprised when u were able to unlock items through levels and just buy them. Kirby is the main protagonist of Nintendo's Kirby video game series created door Masahiro Sakurai and developed door HAL Laboratory. The Kirby series is one of Nintendo's many well-known game franchises, spanning nearly twenty games since 1992.
a poll was toegevoegd: Who would win?